I recently had the privilege to attend a Wind Turbine making workshop for our Tribe. WOW! The technology is amazing and exactly what our community needs. Kris attended the Presbyterians for Earth Care National Conference in Oregon and the Lowlander Center was featured on Darrell Reeck's blog "Growing Green." Read Darrell's blog here. We are saddened to hear of the loss of our colleague and dear friend Bob Gough. The moderated forum will give candidates the opportunity to answer questions about New Orleans’ future with water. How will New Orleans respond to Louisiana's ongoing coastal land loss crisis and restoration efforts? What are the next steps for the City’s flood protection? What will be the future of living with water? And how will the City commit to climate change adaptation and the Paris Climate Accord? Nathan Lott, director of the Water Collaborative of Greater New Orleans, will moderate this discussion. All candidates were invited to participate, and the following have confirmed their participation by submitting bios and personal statements on the issue by the deadline: Michael Bagneris, Ed Bruski, LaToya Cantrell, Desiree Charbonnet, Brandon Dorrington, Troy Henry, Matthew Hill, and Johnese Smith. Sponsors include the Coalition to Restore Coastal Louisiana, The Lens, the Tulane Institute on Water Resources Law & Policy, the Tulane ByWater Institute, the Gulf Restoration Network, the Lowlander Institute, the Okra Inn, and the Water Collaborative of Greater New Orleans. 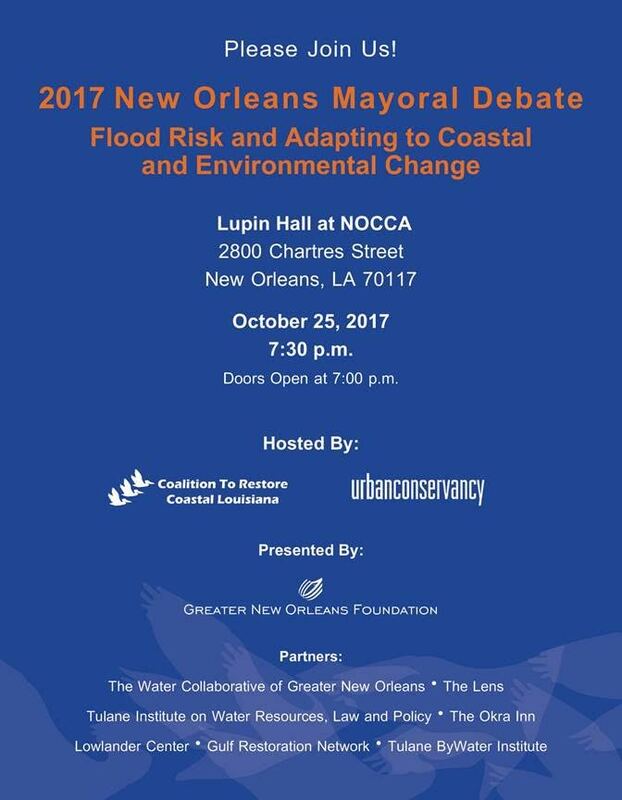 The Mayoral Forum on Flood Risk and Adapting to Environmental Change is hosted by the Urban Conservancy and will be held on the evening of Thursday September 14th from 5:30-7:00pm at the New Orleans Jazz Market, 1436 Oretha Castle Haley Boulevard. The Forum is open to the public, but people are encouraged to RSVP. Doors open at 5:00pm. The Forum will be streamed live at urbanconservancy.org, crcl.org, and TheLensNOLA.org, rebroadcast at 5 pm on September 15th on WHIV FM 102.3 and available for on-demand viewing on multiple sponsor websites following the event. For more information, or to RSVP, visit the Mayoral Forum page at urbanconservancy.org. About the Urban Conservancy: Since 2001, the Urban Conservancy has catalyzed equitable practices and policies related to the urban built environment and local economies through research, education, and advocacy. The Lowlander Center was awarded the 2017 Travelers Excellence in Community Resilience Award. Read about the award here.